Every item offered by The Mermaid and the Crow is handcrafted in our old-world style workshop from 100% local, sustainable sources. Tempting small batch ritual fragrance oils, hand-spun hand-dyed yarn in luxe fibers and fiber arts. The Mermaid and the Crow was founded in 2008 by Deborah Castellano. Ms. Castellano is an avid promoter and purveyor of historic handicrafts, and has dedicated her career to bringing these lost arts out of the museums and back into practice. An average day in her workshop-- nicknamed the Spare Oom-- will have her tending a wide variety of anachronistic arts: from kettle dying wool, to working her spinning wheel in her bare feet, to swirling her pestle in her mortar while she hand presses her perfume oils. Every item offered by The Mermaid and The Crow is handcrafted in this old-world style setting from 100% local, sustainable sources. Ms. Castellano is actively engaged in the broader handicraft community, and is passionate about using her work to promote the gifts of other artisans. Her vision includes not only running The Mermaid and The Crow as a business, but coaching aspiring crafters in these lost arts, as well as creating each and every one of her items herself, by hand, without modern machinery. Every fragrance formulation is unique; beeswax candles are poured by hand into their molds; Dream Ambassadors are brought to life through needle felting; tiny terrarium accents are carefully assembled; and Nuno felted scarves are wet-scrubbed on a washboard beneath the loving hand of the artist herself. 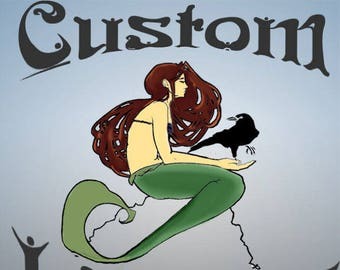 Ms. Castellano is proud to offer exclusive access to her exquisite work via The Mermaid and The Crow shop on Etsy.com. Deborah Castellano is 33 years old and lives in New Jersey with her husband-elect and their two cats. She's hard at work bringing her dreams of owning a small crafting business to life. She especially likes St. Germain liquor and typewriters. Note that it may take up to 7 business days to ship your order due to the busy time of year. A tiny boutique filled with lush, gorgeous little things. Luxuriously soft hand spun hand dyed yarn, small batch hand blended ritual fragrance oils and fiber arts are all found here!